You can acquire knowledge from Wikipedia, books, articles, manuals, conversations with knowledgeable people, etc. You will then learn when, by experience, you "wire" this knowledge into your brain. If trials are hard and time consuming, your wiring will basically be a long (painful) line. But when trials are cheap and fast, the wiring will spread wider as you are free to explore many possibilities. env.SetViewer? provides documentation on the SetViewer() function of env. 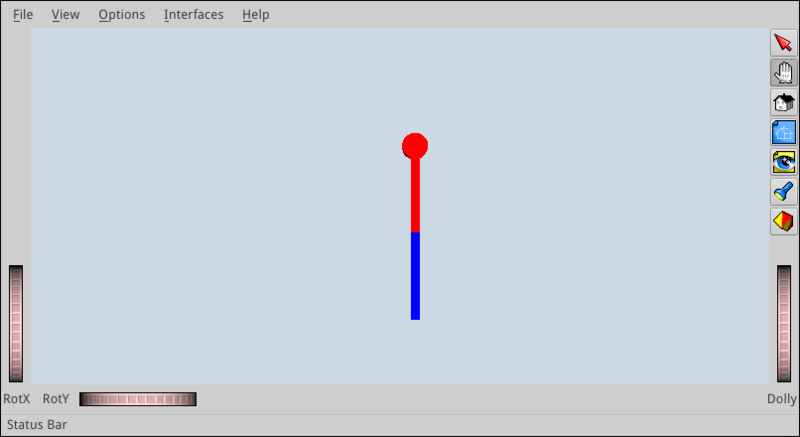 In this post, we will set up an initial environment, create our first robot and see how to manipulate it via the GUI. If you don't have it installed on your system, see the installation instructions for Ubuntu 14.04, or the official documentation if you run another system. In this script, we define three objects: the environment env, the viewer and the robot. The environment object is your main interface with OpenRAVE, from which you will access robots, viewer, drawing primitives, etc. It is defined in an XML file. The user interface has two modes: camera mode and object interaction mode. Press Esc to switch between the two. S + left click: zoom in on the point clicked. After this, the camera will stay centered on the object when rotating. You can switch between camera and interaction by pressing the Escape key of your keyboard. Alternatively, click on the red-arrow icon (first icon from top) in the right-hand panel to activate interaction mode. Translation: click on a face of the cube and drag it around. It will translate the object in the two directions corresponding to the face of the cube. Rotation: click on an edge of the cube and drag it around. It will rotate the object along the rotation axis parallel to the selected edge and passing through the center of the cube. The control cube will vanish if you click again on the object. The text area at the top-left corner of the 3D viewer displays relevant information on the selected object. Here, it says that the pointer is on the link Arm1 at the world-frame coordinates (x, y, z) = (0.10, 0.07, 0.27), with the surface normal at this point n = (1., 0., 0.). The second line tells us that we selected the robot Pendulum, and the third gives us information on the selected joint: name (Joint1), index (1) and angle in radians and degrees. The joint index tells you the position of the joint coordinate in the DOF vectors, which we will use later on to manipulate the robot's configuration. Here is the summary of the controls we have seen so far. There are other buttons in the right-side panel, but honestly I never use them. You will see the robot updated to a different pose in the GUI. This operation, the geometric update of all links of the robot from the joint-angle vector, is called forward kinematics. We generate a simple linear interpolation between the current state of the robot (which may be anything: random, set by the user in the GUI, etc.) The default duration will be \(T = 1\) s.
Whatever the current configuration of the robot is, you should see it swing up to its upward vertical configuration. You now have your first environment set up and you know how to visualize and update your robot from a joint-angle vector by forward kinematics. Next, you will want to compute your joint-angle vectors to achieve a particular goal, for instance: how to put the tip of the robot at a specific location in space? The answer to this question is called inverse kinematics (IK). 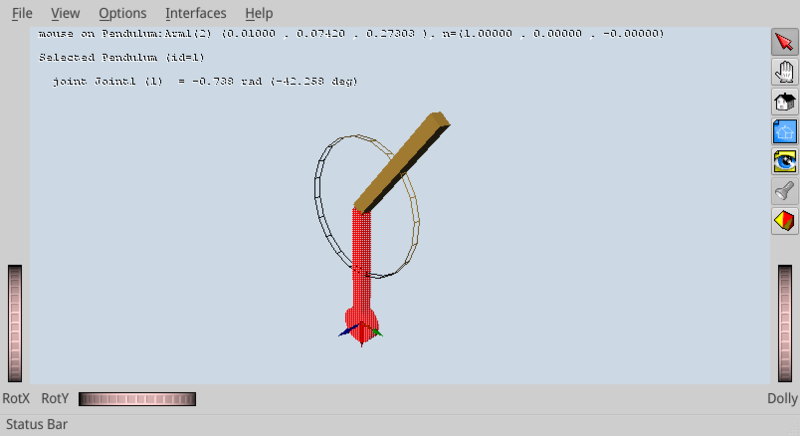 For robotic arms, OpenRAVE provides a closed-form symbolic IK solver that you can call via the inversekinematics module. With symbolic IK, you first spend time compiling the IK solution to your robot model into a C++ program. Then, you can compile and execute this program at runtime to solve for inverse kinematics faster than with any other numerical method. See Rosen Diankov's PhD thesis for details. Unfortunately, symbolic IK only applies to robots with up to 6-7 degrees of freedoms. For large-DOF mobile robots such as humanoids, the state of the art is to use multi-task inverse kinematics based on quadratic programming (QP) or hierarchical quadratic programming (HQP). A ready-to-use QP-based IK solver for OpenRAVE is provided the pymanoid library for humanoid robotics.